The Energy Grip features an innovative, proprietary design that decreases the level of fatigue caused by the effects of repetitive shock and vibration, enables an enhanced feel for the game, and provides a superior playing experience. While 200 pieces last, see below. Patented technology developed at the University of Texas features an innovative, proprietary design that solves the problem of harmful shock and vibration. Strategically placed longitudinal cavities, or “air pockets”, provide a distinct advantage to golfers of all skill levels. The “air pockets” create radial ribs which in turn allow torsion to be isolated providing an unparalleled vibration energy dissipation system. A combination of the outside of the grip or “mass” and the radial ribs, create the dampening mechanism. By placing evenly spaced receptacles in the grip, we have determined that more vibration is released through the system, rather than into a player’s hands or arms. In addition, Energy Grips remain traditional in player “feel” and “feedback”. • Independent lab tests prove a 60% or greater vibration reduction compared to the leading grip. • Reduces vibration felt in the swing by dissipating shock experienced through impact. • Reduces the effect of “bad shots”. 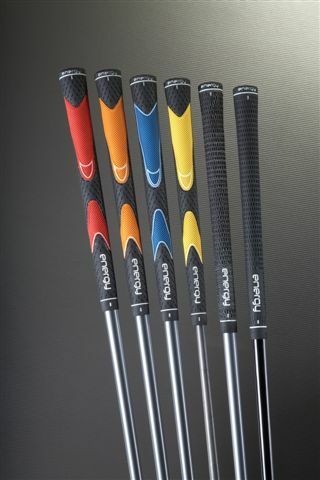 • Increases feeling of control with crisp impact that preserves the feel of each swing. • Lessens fatigue that results from repetitive vibration. Rogers (Red, Orange, Blue, Yellow), Cord, and Tour. The EG Tour Full Cord allows golfers to have better traction and moisture wicking in all weather conditions. Was $10.99 each, clearance price $1.99 each with minimum order of 13 grips. Total available 200 pieces. please order below.